Recipient of the 2014 Governor General's History Award for Excellence in Museums: History Alive! Le prix Histoire Vivante! est accepté au nom des Musées de la civilisation à Rideau Hall, Ottawa, 2014. The History Alive! 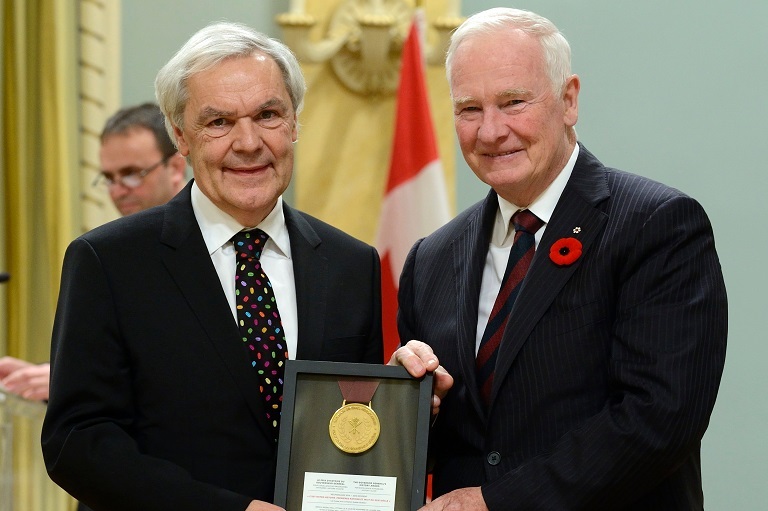 award being accepted on behalf of the Musées de la civilisation at Rideau Hall, 2014. Canada is defined in large part by the experiences and prospects of its First Peoples – past, present and future. No museological representation of this has been more mature, more inclusive or more thoughtful than This Is Our Story: First Nations and Inuit in the 21st Century, a new permanent exhibition at the Musées de la civilisation in Quebec City, Que. Bold, contemporary and respectful, the exhibition presents Aboriginal stories through Aboriginal voices, based on a prodigious, ground-breaking consultative regime. It showcases leading scholarship and challenging perspectives, exquisite design and unforgettable stories. The whole exceeds the sum of its parts, offering a beautiful, honest and at times difficult immersion into the lives and dreams of Canada’s many and varied First Peoples. Rich, contemplative and utterly engaging, This Is Our Story succeeds as all great exposés must by inspiring humility, encouraging hope, building empathy and stirring passion. There are exhibitions that entertain us and ones that educate us, and ones that, perhaps most difficult of all, enlighten us. And then there are those precious, precious few that do all three. This Is Our Story is one such — a triumph of imagination and execution, and a uniquely inclusive and unfolding drama about us all.